In 1942, after the British successes in North Africa, there were thousands of Italian prisoners, and camps were needed to house them. 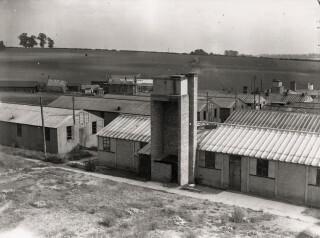 In January 1943 the War Office compiled a list of possible sites in Britain, (the threat of invasion had passed,) and at the beginning of February told the Harpenden Urban District Council that they intended to requisition a site at Batford to the north of Common Lane, and commence immediately to build a Prisoner of War camp. The Council raised no objection, asking only that it should not encroach on to the Council’s allotment site, and that it should remain only for the duration of the war. There were not many houses in Batford at that time, and the Council pointed out that the sewage system would need enlarging. The camp opened before the system was ready, and toilet arrangements for the first few weeks were rather primitive. No. 95 P.O.W. 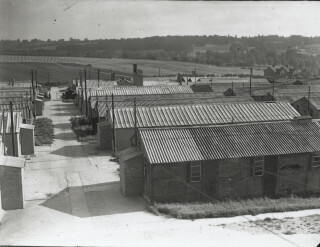 Camp, Batford, opened in May 1943 for Italian prisoners, originally housed in tents which were gradually replaced by huts. It accommodated about 600 men. In October 1943 the Italian government signed a peace treaty with the Allies, and shortly afterwards declared war on Germany. This altered the status of the Italians. Although still prisoners, they would be granted certain privileges and better treatment. 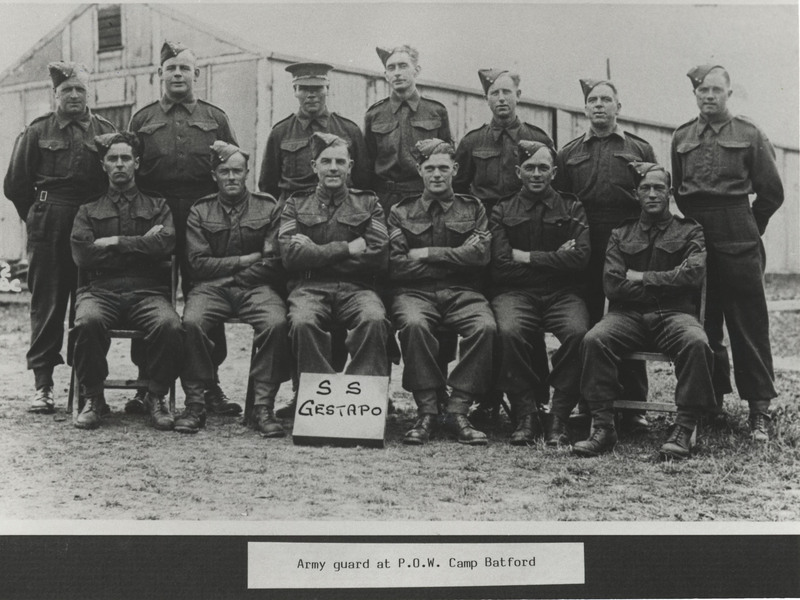 In July 1944 the camp was re-designated as an Italian Labour Battalion Camp. 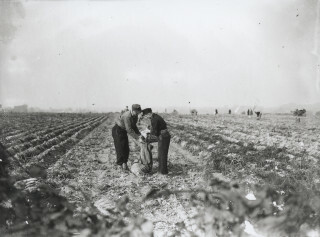 The men were employed mainly on local farms. In November 1944 the Italians were moved out: some into hostels, and some were lodged at the farms where they were working. The camp then became a German P.O.W. Working Camp, with 750 prisoners. They were “other ranks” (ie not officers) and as such, under the terms of the Geneva Convention, they could be required to work for their captors. Some were set to do general labouring, but most, in these early days, were employed in agriculture. The men were taken each day, in small working parties, by lorry to the farms where they were to work. The prisoners were restricted to camp in the evenings and at weekends, but they had many ways of spending their time. They had a film show once a week, and there were occasional lectures organised by the British, and discussion groups organised by the Germans themselves. The prisoners had their own officials: there was a CampLeader, a Political leader, and a Study Leader. The discussion groups took place regularly: they were well attended and aroused much interest. They covered a variety of subjects, such as politics, current events, trade unionism and so on. Many of the talks introducing the discussions were given by the prisoners themselves. They had their own drama group, who put on the occasional show for their fellows. The camp had a library, with a selection of both German and English books. There was a camp newspaper, in German, and a selection of British newspapers. There were classes to learn English, French, German literature, history, geography, mathematics, chemistry, physics, applied electricity, building and architecture, and commerce. There was a wireless in the CampLeader’s office, with about a dozen loudspeakers around the camp. But along with all this activity, discipline was maintained. In December 1944 twenty-one prisoners were charged with collective indiscipline. They refused to work because they had only one uniform each. They were given periods of detention up to twenty-eight days, in some cases with punishment diet no. 1 (which was, I think, bread and water.) The men played football within the camp, against each other, until the war ended. Then they were eventually allowed to play civilian teams within a five mile radius of the camp. In August 1947 their team played Harpenden United Football Club in RothamstedPark. The Germans were delighted to be leading 2 – 0 at half time. They were even more delighted at the end of the game, which they won by 5 goals to 2. At the end of the war in May 1945 the men hoped to return home. But, for several reasons, they were not immediately repatriated. Germany was in a state of chaos, and with no civilian government, was under military rule. 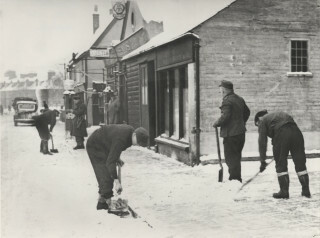 There were severe shortages of food and accommodation, so although Germany could have done with the men’s labour, it was not possible to return them. Besides, until Britain’s own servicemen had been demobbed, the German labour was needed here, particularly in agriculture and rebuilding. Also the British Government wanted to de-Nazify and re-educate the men before their return. So the camps remained. 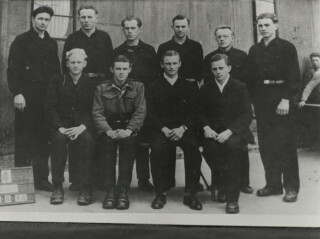 All Prisoner of War camps were inspected by representatives of the Red Cross, who reported on all aspects of the camp. Unfortunately those of the war years appear not to have survived. 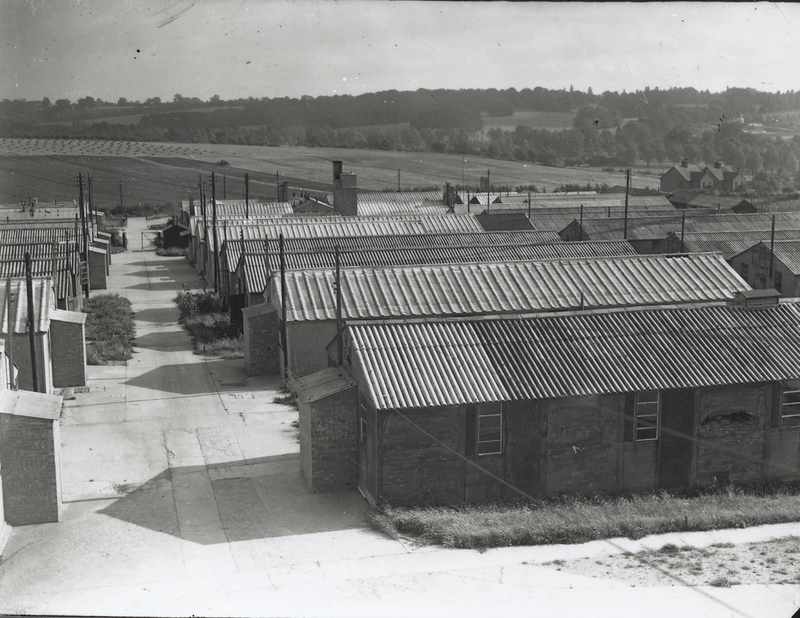 At that time Batford Camp had three satellite hostels, one at Hatfield Hyde with 60 men, another at Stanborough with 56, and the largest at Lemsford, which held 265. 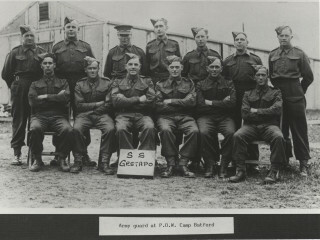 There were also 932 men in the main camp at Batford. 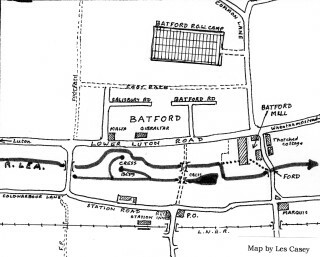 Fifteen months after the war’s end, repatriation was under way, and hundreds of men had gone from Batford, but were replaced by men from other camps. In March and April 1946 there were two large intakes, one from Canada and one from the USA, with a total of 939 men, 200 of whom had gone to Lemsford, the remaining 739 men staying at Batford. Morale amongst these men was not very good. Those from America were particularly disgruntled: they had been told by the Americans they were going straight home to Germany. Instead they landed at Liverpool and were brought to Batford. Before coming to England they had been employed in picking oranges in Florida sunshine. Now they had the dull, cold and wet English climate. Bruno Liebich spent a year working on farms around the area, at Bovingdon, Berkhamsted, Slip End, Tring, Elstree, and GorhamburyPark, and found it tedious and boring. He was hoeing, potato picking, and laying drainage pipes in the winter. After a year he managed to get a job as a dustman for St Albans Council, together with eleven other POWs. He reckoned that was one of the best jobs in the camp. He was also transferred to the hostel at Lemsford. The war ended in May 1945, but restrictions on the prisoners were not relaxed until the tail end of 1946. They continued to work outside camp on weekdays, but in the evenings and at weekends they were confined to camp. There was little public sympathy for them. Firstly, nearly every family had been affected by the war in some way, and were in no hurry to forgive and forget. Amongst most people these camps aroused feelings of revulsion for all things German, including the prisoners. An anti – fraternization law was passed, making it illegal to talk to the prisoners socially: only conversation in connection with work was allowed. Most of the men were working on farms: some were collecting the potato crop from Harpenden Common: a few became dustmen for the U D C: and some were employed on general labouring, preparing the foundations for Grove Road to be built, amongst other jobs. 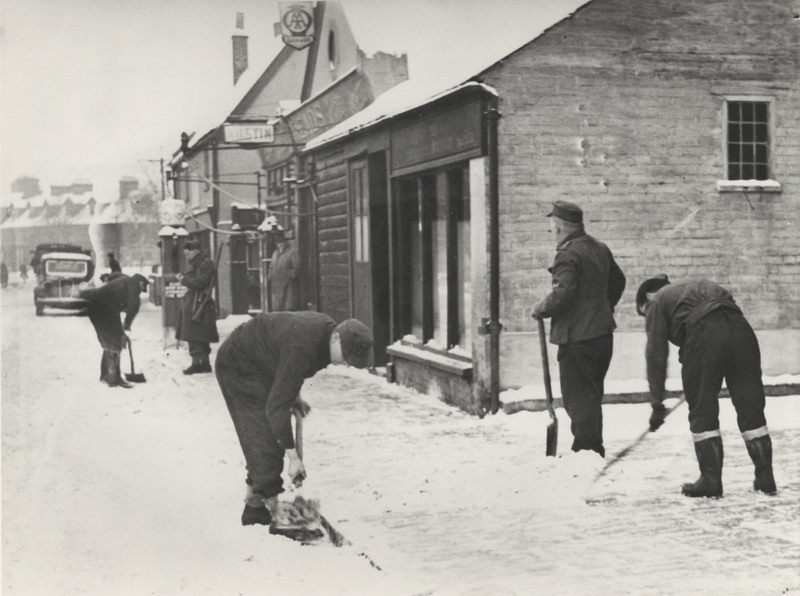 (In January and February 1947 several men were engaged in snow clearing, for days on end.) But by 1946 the public mood had changed. The anti – fraternization laws were being more or less ignored, and tentative friendships were established. 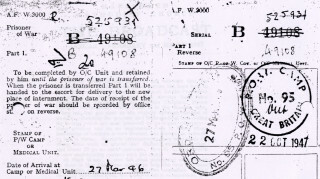 Repatriation started in September 1946. 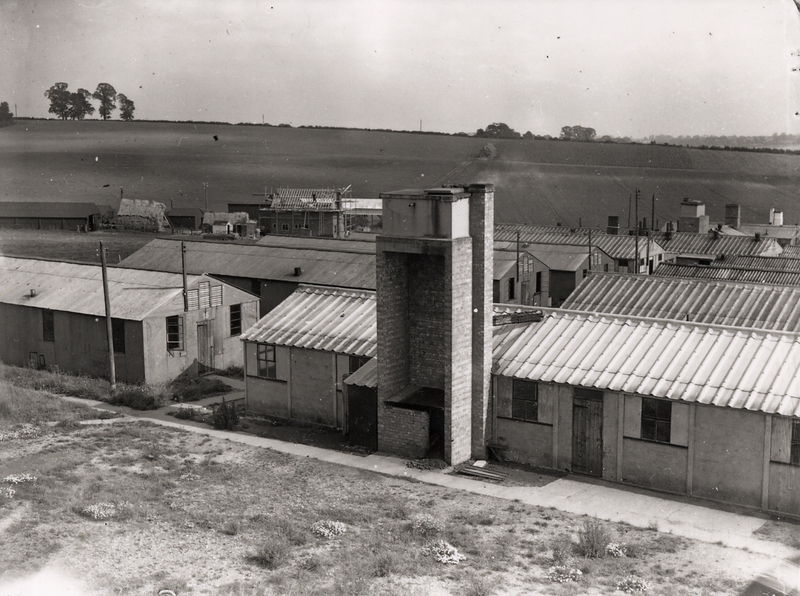 Three months later in December prisoners were allowed out of camp at weekends, unescorted. Many of the men sent letters from home: this is just one example. “I will maintain the friendships I made during my imprisonment in England. Pure friendship with dear, warm hearted people. Greet all my friends of the Social Hour, the ladies and gentlemen who gave me so much – tea, coffee, cakes, music, songs and films. Also the dear little children in the Sunday School. I shall never forget these good people in all my life. I think a great deal about the beautiful evenings at the Social Hour. It was always a great pleasure to come.” S. C. The Church also opened its doors at 9.00am on Sunday mornings for the men to attend a Lutheran service, in German, conducted by Pastor Gunter Bartolomans. The Roman Catholics attended Mass at Our Lady of Lourdes in Rothamsted Avenue. Other people were trying to make life a little better for the prisoners. In February 1947 Arthur Hopkins wrote to the Harpenden Free Press, asking Harpenden people to help lay a firm foundation for peace. He said he had been told that the Germans could be invited out to private homes on Sunday afternoons between 12.30pm and 5.30pm on application to the Commandant, and he invited people to do this. Many people did so, and friendships were formed, in some cases, more than friendship. In March 1949 one young lady, Eileen T., married Rudi W., an ex POW. They had met when her parents invited two men home for tea. Rudi had elected to stay in England, and worked at Aldwickbury nurseries. It was also possible at this time for private individuals to employ the men on a variety of jobs, after applying to the Commandant. Many people asked for them as gardeners. At Christmas 1947 the prisoners were allowed to travel within a 100 mile radius of the camp, rather than the previous 5 miles. 330 of the men had 48 hour passes to visit friends. Many others were invited out to Christmas dinners and parties. Altogether, 80% of the men were out of camp. For those who were left, large numbers of parcels were received, some from home (in Germany), some from local people. Some of the parcels from Germany contained foodstuff and such titbits as packets of biscuits. There were plenty of Christmas cakes at camp, the POWs having specially saved up their rations. Most of the British troops were on leave; those remaining had their own Christmas dinner. As repatriation approached there were, perhaps surprisingly, a considerable number of men who did not want to return to Germany. Many of them lived in Eastern Germany, which was then controlled by the Russians, and from the little news that they had received, preferred to remain here. Others, possibly, wanted to start a new life. Whatever the reason, nationally, over 250,000 men applied to remain here. They were interviewed to see whether they were suitable. If accepted, in accordance with the Geneva Convention, they were sent to Munsterlager in Germany to be officially discharged from the Forces. Then, as civilians, they were given ration books, money and travel warrants to visit their families. They were allowed to stay for a month before returning to Britain to work. It is not known how many men from Batford did this: certainly quite a few did. But the majority went home. 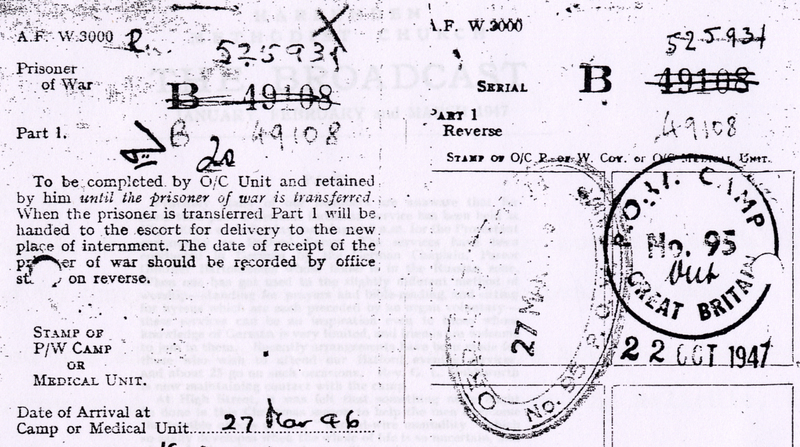 Repatriation was completed in July 1948. The Urban District Council then took over the camp, renovated the huts each to accommodate two families, one at each end, and used them to help the housing shortage. 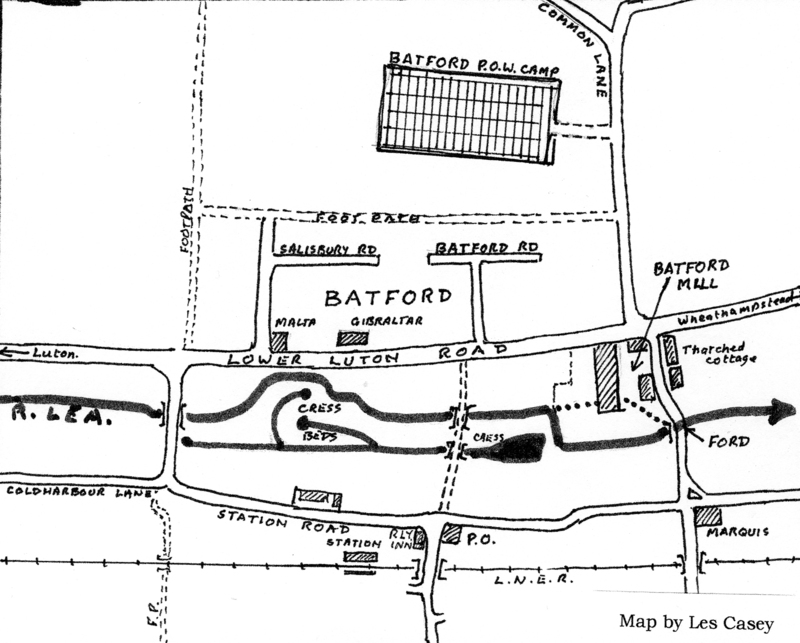 The site was closed in 1958, when the Batford housing estate of Milford Hill and Tallents Crescent was built. There were no escapes from Batford Camp, although there was a moment of excitement when foundations were being dug for the housing estate. A large tunnel was found, extending for some distance. At first it was thought that it might be an escape tunnel, but after examination it was found to have been dug many years earlier, to obtain chalk for mixing with the soil, a common agricultural practice in this area. Thanks to Mr Bruno Liebich, The National Archives, and High StreetMethodistChurch. This page was added on 04/01/2010. In the late ’40s/early ’50s loads of us from Manland Primary (plus probably children from other Harpenden schools) went potato-picking in Rothamstead Park……..i think we received a small amount for our labour……perhaps the German POWs worked here in previous years? Many thanks; I’ve made the alterations (having checked it over, what we had there didn’t make sense). I’ll enquire about copying the comments – it may be necessary to get permission from the individual commenters. I am writing from Harpenden Local History Society. We have a copy of this page on http://www.harpenden-history.org.uk/page.aspx?id=98&path=0p4p85p. You may wish to make the same amendment. Looking through to the comments on your page, I am very interested to see that there have been a number of comments, and it would be really helpful if these could be copied to the page on our website. In particular I am delighted to see that Bruno Liebig has been in contact – we will certainly want to pick up links with him. Our most recent exhibition was The Home Front in Harpenden – 1939, and we will be focusing on the later stages of WWII in due course. Apologies for including all this in a comment attached to the page – I could not find a general ‘ contact us’ link, except for those volunteering to join HM. Hello, My Dad Heinz Anton Schaub was a PoW at Batford Camp – he was previously a POW in the USA, so this article has been very interesting to read. My Dad married Joyce Currant of Luton, whilst he was a PoW. For his wedding at St. Saviours Church in Luton, He had to wear a British Airforce uniform dyed brown with P o W on the back and return to camp after his wedding. One of his fellow PoWs painted an oil painting as a gift for their wedding, another made handmade wooden candlesticks as a gift. It’s a long shot but I wonder if by some coincidence Bruno Lieblich might have known my Dad. I would really be interested to know more. My Dad passed away sadly in 2007. Gosh it does seem a shame that they built that sink estate on the land round the old POW doesnt it ? What a pleasant place Batford would still be if they hadn’t . FOR Alan TISSINGTON. I AM ALSO KEEN OM FINDING EXACT SPOT OFGORHMBURY PARK CAMP. I have been given a clue. If you like we can go together to find it one day. I thought I had written to you about this before. 852420. Bruno – All of the common from the cricket pavillion to Acres Corner was planted one year with wheat or barley and the next pototoes. Also all along the A6 from Cravells Road to Cross Lane. The picture of the German potatoe pickers was certainly taken there. I know because I lived in St. Johns Road and spent all my spare time with them. Most of the details in this brilliant and historically very valuable article appear to have been thouroughly scrutinized, but I dare to question the following: “250 000 men applied to remain here.” According to M.B.Sullivan in his book “Thresholds of Peace* (1979) he states on page 384 (1st line) that “25 252 (POW’s) elected to stay”, as the official figure. I am aware of the 5-mile limit for outside camp movements which came into effect in December 1946, but as I left the country in October 1947 I had never heard from anyone about a 100-mile limit. 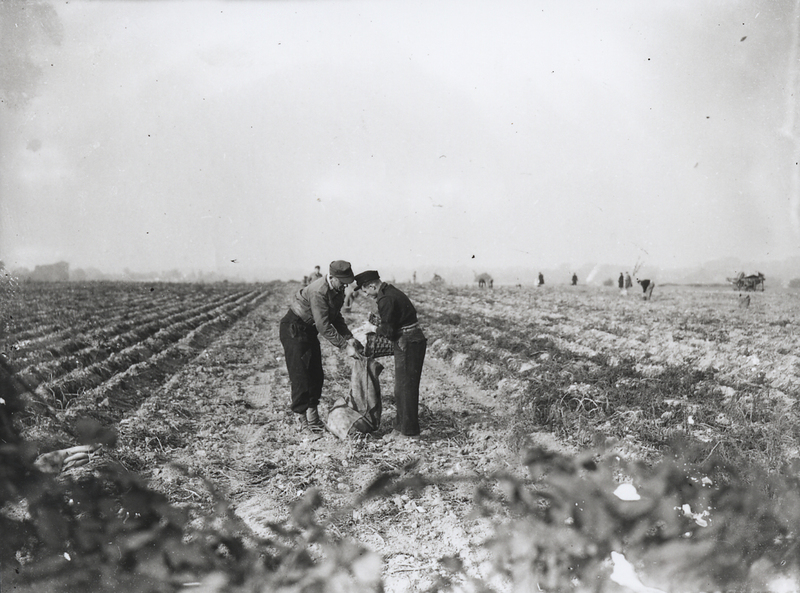 (Dec. 1947) It is generally stated that the photo of potato-picking POW’s was taken on Harpenden Common, I have my doubts about that. a) I drove past the common frequently in those days and cannot recollect potato fields there, and the vast space on this picture looks more like Gorhambury Park where I picked potaros in the autumn of 1946. This is not criticism. Yes, I stayed at Batford Camp for 14 months and another 3 months at Lemsford Camp. A very good article. I am still living in St.Albans, probably the only ‘survivor’, as far as I can tell. This informatiom will be most useful for my autobiography, which I am writing just noe. I can remember seeing German prisoners working IN the River Lea near the Batford Methodist Church (my Sunday School), they must hve been dredging it out. I can also remember visiting a family who lived in one of the converted huts later on. 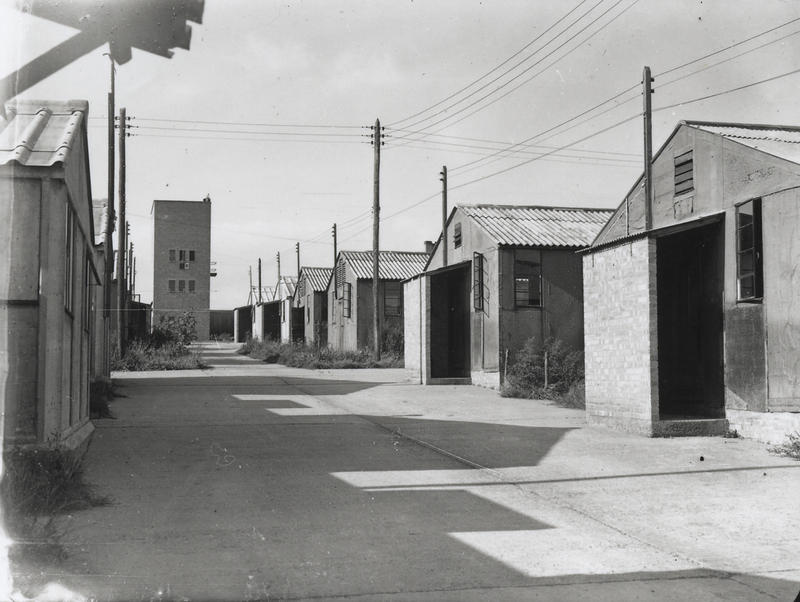 They also lived for a time in old army nissen huts that were situated in the grounds on a large house between the end of Cowper Road and Crabtree Lane. I remember so well the German prisoners “spud bashing” on the commom at Walkers Road. As young children we were placed on top of a pile of baskets and had to say “Heil Hitler” three times to be let down. Do you remember the Coronation of Queen Elizabeth II 60 years ago? Judy Fryd CBE, Harpenden, campaigner & founder of Mencap.